Ever experienced this scenario? You’re helping a friend - or worse, one of your parents - over the phone with his or her computer. And he or she either doesn’t know what you are talking about or is too slow to completely carry out your instructions in this lifetime. Wouldn’t it be great if you could just see what they see and remotely input with your keyboard and mouse? VNC is nice and all but who wants to walk someone through additional instructions for installing a VNC server? How about that crippled terminal service derivative called Remote Assistance? I’ve used that before and it is pretty limiting. Wouldn’t it be great to actually be able to log on their computer like in Remote Desktop? If your friend is using Windows XP, Vista, or Server for business environments (i.e. not “Home Edition”) you may be in luck. They only problem is actually enabling the Remote Desktop protocol, which, by default, is turned off. How on earth does one turn on the RDP? You can somehow use the remote registry feature and change a couple of settings. Visit the “regedit” command. Select “File” and you will see an option called “Connect to Network Registry.” One way or another, you are supposed to use that command and manually hand-edit the remote desktop option. Sounds complicated? Not to worry! With today’s freeware program, you won’t have to mess with that entire overhead. 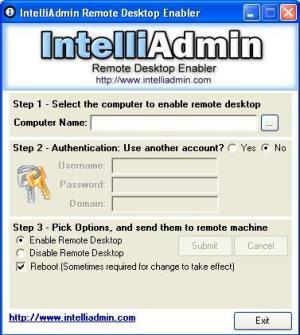 IntelliAdmin provides us with a minimalist program called Remote Desktop Enabler. This simple program just prompts you for the host name, ip address, or TLD name of the target computer with the username and password. You then specify whether you want to turn the RDP on or off. You can even force the target computer to reboot if necessary. Give it a couple of seconds after clicking “Submit” and you’re in business! Despite the great simplicity of this program, there is one this to watch out for. The target computer cannot reside behind a router. Ports would manually have to be opened in order to access the remote registry let alone the remote desktop protocol. This would pretty much defeat the whole purpose of helping a friend with their computer since router configuration would be necessary. Keep this program on your flash drive. You’ll need it one day! This entry was posted on Friday, May 11th, 2007 at 12:29 am	and is filed under Cool Stuff, Hacks, Internet. You can follow any responses to this entry through the RSS 2.0 feed. You can leave a response, or trackback from your own site. I think VNC is much better than Remote Desktop.